H.Y. Hanna is the award-winning author of the best-selling romantic suspense TENDER series, as well as the sweet romance series, Summer Beach Vets (Escape Down Under). She also writes children's fiction and - under the pen name, "Penelope Swan" - a romantic Regency mystery series inspired by Jane Austen's 'Pride and Prejudice'. After graduating from Oxford University, Hsin-Yi tried her hand at a variety of jobs, including advertising, marketing and ESL teaching, before returning to her first love: writing. 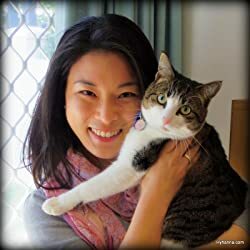 She worked as a freelance journalist for several years, with articles and short stories published in the UK, Australia and NZ, and she has won awards for her novels, poetry, short stories and journalism. Born in Taiwan, Hsin-Yi has been a globe-trotter most of her life - she grew up in the United Arab Emirates, was schooled in the U.K. and U.S., and worked in London before emigrating Down Under. She currently lives in Perth with her husband and a rescue kitty. She loves dancing, spicy food and watching repeats of her favourite TV show: Fringe. Big Honey Dog Mysteries - kids & dog lovers of all ages! Please enter your email address and click the Follow button to follow H.Y. Hanna!